DataTracks is pleased to announce that its Disclosure Management System (DMS) is certified by XBRL International, a global organization founded to improve the accountability and transparency of business performance globally, by providing the open data exchange standard for business reporting. The Certification guarantees that the XBRL output generated by the software meets the relevant XBRL standards. Suresh Illath, Chief Operating Officer opines, "Certification adds more value to our already-reliable software and reassures the users on the commitment of DataTracks towards maintaining appropriate standards in regulatory reporting." The Certification has been awarded after thorough evaluation of the software to ensure that it is impossible to extract an XBRL that is unacceptable to file with the regulators. Prakash Ramachandran, Manager for Product Design affirms, "With this certification, we have now removed the need of an independent validation engine to verify whether the XBRL output is valid before submission to the regulators, eventually reducing the compliance time and cost for our clients." 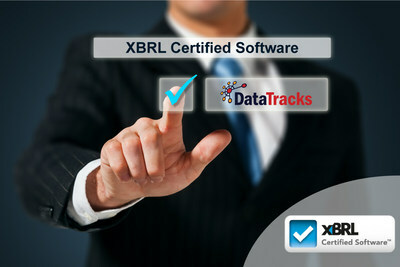 The Certification can be identified by the XBRL Certified SoftwareTM logo issued by XBRL International, Inc. An authentic and valid logo will redirect the user to the website of XBRL.org and will provide complete details of the software that is being certified, list of all modules that have received the certification, and the date and validity of the certificate.